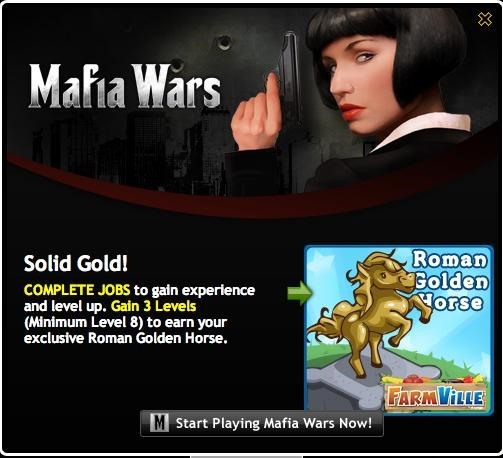 You can win the FarmVille Roman Golden Horse statue by completing 3 levels in mafia wars! You have until Monday, Nov 1st to get this mission! When you see this slide up, click on it. 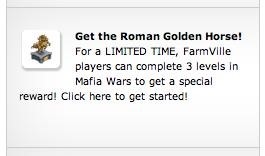 You can then accept this screen to go to Mafia Wars in a new tab. If you didn't catch the slider you can click the news box under the farm to get the above screen. 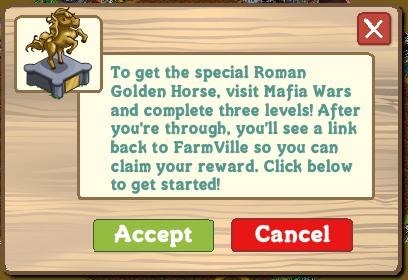 Finish those levels and put your horse statue on your farm! Time Left is 5 days - til Mon, Nov 1.